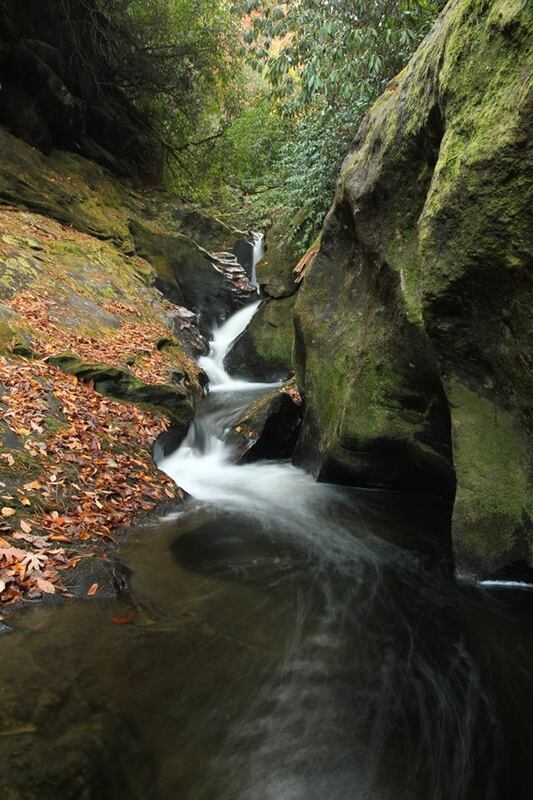 Waterfall Info: This series of waterfalls is situated inside a canyon at the lower end of Holcomb Creek. There are five distinct drops inside the canyon. 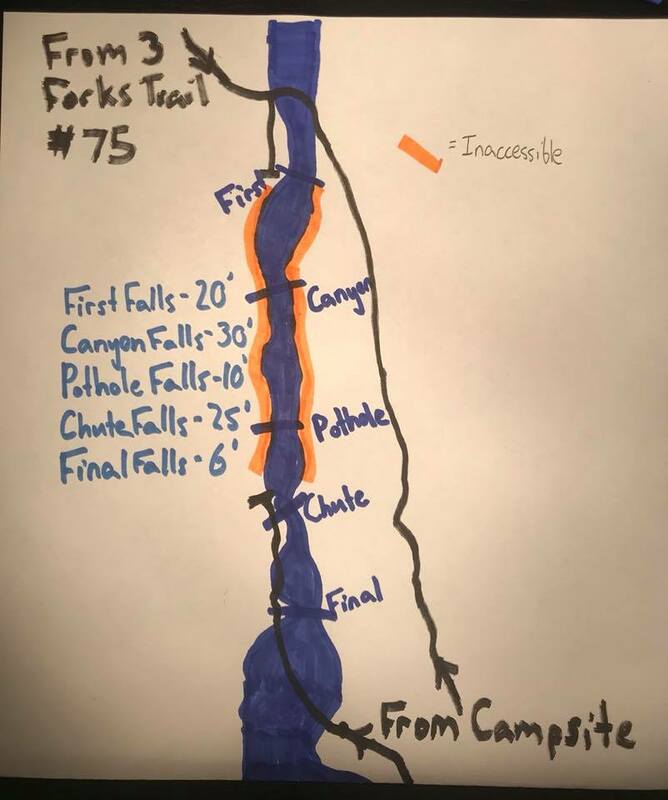 From top to bottom: First Falls (20'), Canyon Falls (30'), Pothole Falls (10'), Chute Falls (25'), and Final Falls (6') - see the map below. First Falls is the drop immediately below the Three Forks Trail crossing of Holcomb Creek. Final Falls is the last cascade on Holcomb Creek where it drops into Overflow Creek. Due to the proximity of the individual drops, it makes sense to refer to the whole series of falls as Holcomb Canyon Falls (not to be confused with the 120-foot Holcomb Creek Falls several miles upstream). 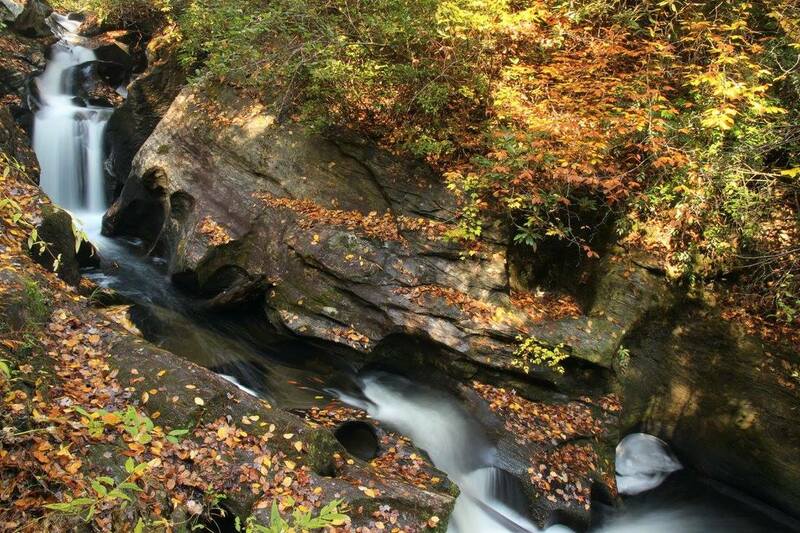 Access Info: The Three Forks Trail starts at John Teague Gap along Overflow Creek Road (FS 86) and leads 1.5 miles to Three Forks - the place where Holcomb Creek, Overflow Creek, and Big Creek come together to form the West Fork of the Chattooga River. The last 0.1 mile of the trail is an extremely steep descent high above Holcomb Canyon Falls. Waterfallers with experience in cross-country hiking will find it reasonably easy to scramble off the main trail to the base of First Falls at the top of the canyon and to the base of Chute Falls near the mouth of the canyon. However, the two drops in between (Canyon Falls and Pothole Falls) are inaccessible to all but the most experienced canyoneers. These two falls require rappelling to view. Final Falls can be easily viewed if one wades downstream from Three Forks.